So your son or daughter is new to gymnastics! First, congratulations, gymnastics is an exciting sport that will help your son or daughter grow as a person and athlete. The information here is designed to provide helpful tips for parents new to gymnastics. There is a great deal of information to learn about competition. Some of the things you will learn will be unique to your gym, but others are pretty universal for all gymnast’s parents. Gymnasts are expected to be in the gym on time, and also need to arrive at competitions at the appropriate time. If your gymnast continually arrives late to practice, they are missing out on warm-ups or instruction time. In some situations, school or parent’s work schedules make arriving to practice on time difficult. If this happens to you, talk to your gymnast’s coach about what your child can do to make-up missed time. Every gymnast has a bad day once and awhile. If your gymnast comes home complaining about practice, you shouldn’t immediately worry. When your kid comes home and has had a bad day at the gym encourage them to work through the difficult times. Perseverance is a life lesson that every kid should learn early in their life. Meets are exciting for gymnasts and their parents. When you get your first gymnastics schedule, you may be surprised to see there isn’t an exact time or date on the schedule. Instead, it probably says something like Saturday/Sunday with no times. Meet schedules often aren’t available until about a week before the meet. No matter what you have going on in your life, it’s not okay to call the hosting gym for times. Instead, you just need to be patient and trust that your gym will deliver the meet schedule as soon as possible. If you browse Pinterest, you will see there are tons of cute gymnastics hairstyles. In reality, you just need to make sure your daughter’s hair is pulled back in a way that will stay intact during the meet. To do this properly, try out a hairstyle before sending your daughter to practice. If her hair is still neat and intact at the end of practice, it will be great for a meet. It’s also a good idea to NOT use gemstones, fancy barrettes, or anything else that could come loose during a meet. Glitter is usually always a good idea, but your daughter’s gym may have specific rules about the amount of glitter you are allowed to use. If in doubt, it’s best not to overdo it with the glitter. You may be eager to put make-up on your little gymnast, but it’s not a necessity, especially for very young gymnasts. If you simply can’t resist, keep make-up to a minimum. When your gymnast cries, gets angry, or defiant on the floor, you will want to swoop in and save them, but you shouldn’t. Instead, when your gymnast is on the floor with their coach, you need to stay in the stands and let the coach handle anything that comes up. If your son or daughter’s coach needs you, they will get you. Otherwise, they will handle the issue themselves, and their relationship will be stronger as a result. Under most situations, meet fees aren’t refundable. If your daughter or son gets sick right before a meet, you likely won’t get your money back. Judges don’t want to see nail polish on your gymnast’s finger or toes. To avoid deductions from the judges, you need to remind your gymnasts to remove their nail polish before any meet. Gymnasts also can’t wear more than one stud pair of earrings during a meet, and can’t wear any other type of jewelry. No matter what happens, parents are not allowed to enter the competitive floor during a gymnastics meet according to USAG sanctioned rules and safety certification policies. If your son or daughter is injured during a meet, you may come down to the floor, but should not enter it. Coaches are certified to handle injuries and will make sure your child receives the medical attention they need. Many gymnastics parents cheer loudly from the stands. While being enthusiastic is okay, it’s important never to be disrespectful. Don’t ever heckle other teams or talk badly about gymnasts, other parents, or coaches. Check your cameras and recording devices before taking photos or videos at a meet. There is never any flash photography allowed at a meet. If you don’t understand a particular event score, it is not okay to talk to a judge about the score. Instead, talk to your gymnast’s coach. Coaches can often tell you exactly what happened during a routine and can explain the particulars of a score. Leos need to fit like a second skin, so it’s important to buy a leo that fits her now! Avoid the temptation to buy a leo she can grow into to. Leos should be hand washed and laid flat to dry to keep them looking new. Don’t buy grips unless your daughter or son needs them. Never change the type of grip during a competitive season. Do you have tips for gymnastics’ parents? Feel free to add them in the comments below. My little nephew really wants to get started in gymnastics soon. So, I appreciate you talking about how you should not take flash photography at a meet. That will be good for my family to know if he does start gymnastics. Sorry I replied so late, but the reason you should probably have a bun is because if your gymnast was in a handstand or something it is a deduction if it touched the equipment. That is why it is recommended to wear a bun, because it’s “distracting” to the judges. 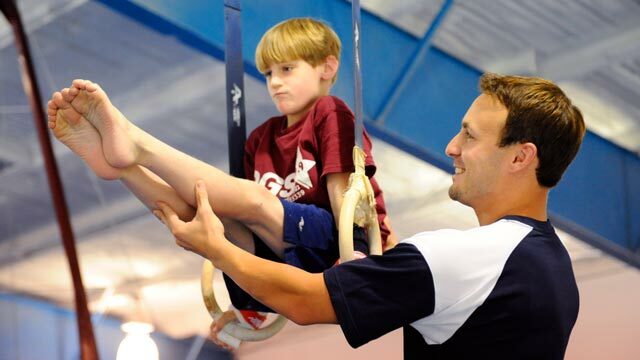 Pingback: Top 7 tips for parents of gymnasts – Performance Gymnastics Academy Blog!